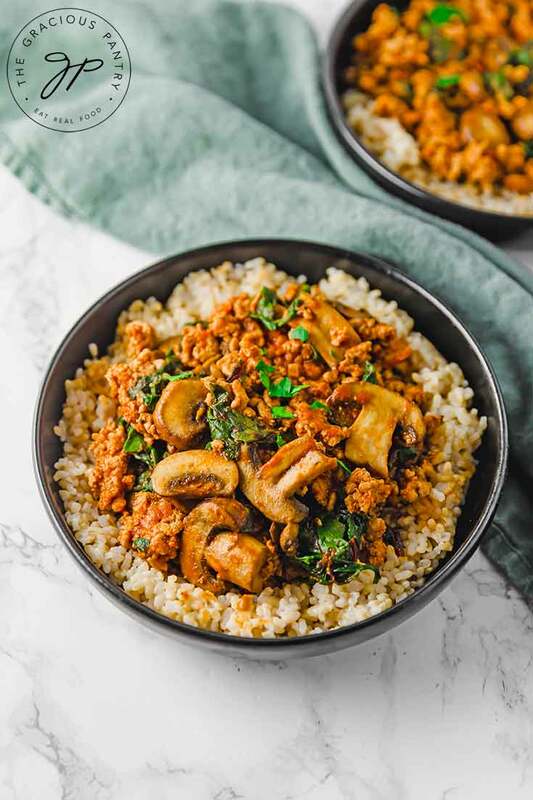 This clean eating mushroom brown rice bowl is a delicious and filling meal. So I have a new obsession with brown rice bowls. I love them because you can balance out the carbs and protein really easily and any veggie will do. I will be doing lots of these! 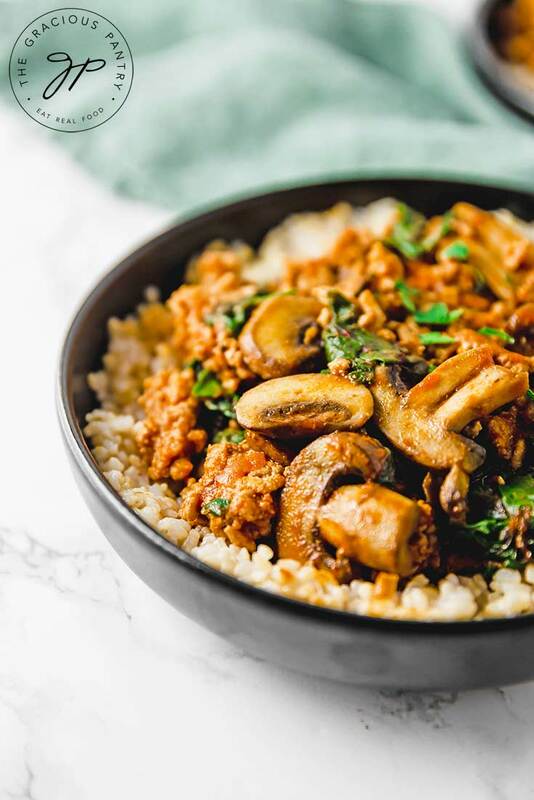 The truth is, sometimes you just need a good, 30 minute meal that is naturally pretty balanced nutritionally so you don’t have to think about it. You just cook it and enjoy it and feel good about eating healthier fare. This is just such a recipe! 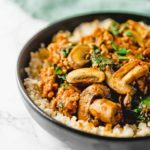 Mushrooms are incredibly good for you! Here’s what they contain in varying amounts. They help support the immune system via their selenium content. 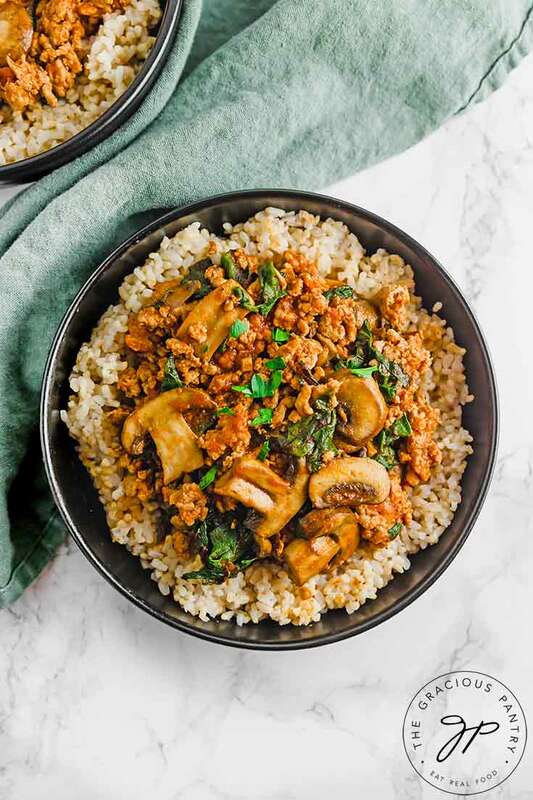 A delicious brown rice bowl for dinner tonight! Sauté' the chard, green onions and mushrooms in the olive oil until they just begin to wilt and you have a little more room in the pan from the chard cooking down. Add the turkey and continue to cook until meat is cooked through. While the meat cooks, add the garlic powder, balsamic vinegar, Italian seasoning, and tomato sauce. When done, serve over brown rice. Season with salt to taste or some parmesan. You won't need both. Just one or the other. Recipe from the Gracious Pantry archives, originally posted 1/22/12. Dana – Hope you enjoy it! Michelle – I have a really good oatmeal casserole. Or did you mean something savory? What could I use in place of chard?